Football programs are built on traditions. Certain programs do a great job with building tradition, and some don’t. How does your program do? Do you have tradition that exerts pride in your players and alumni? I believe one key in retaining excitement year in and year out from your alumni and your community is building tradition. 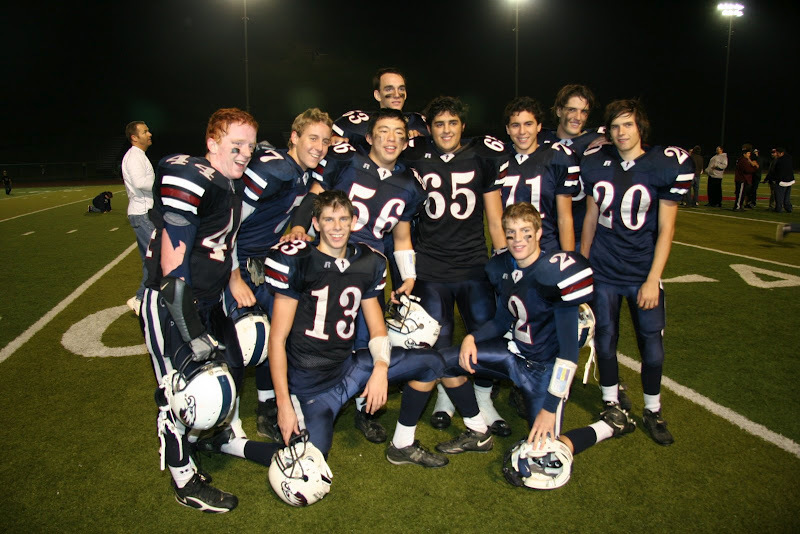 My seniors at Capo Valley Christian, class of 2007. These kids won 2 games as sophs, none as juniors. In my first year with them, 2006, we won 5!! I wish I had been able to coach these kids all four of their years! Chris Wilhelm, 44, coached with me for three years after graduating. Great running backs coach. Fallbrook High School where I played and started my coaching career had a few traditions that I really liked, and so I carried them with me to other schools I’ve coached at. Two of these specific traditions are in regards to saying goodbye to your seniors, and honoring them in a way that says thank you for your dedication to our program, thank you for your commitment. I don’t know when or how it started at Fallbrook, but the last 40s is one of the best traditions they had, and one of my favorites that I’ve carried on. It’s something that my seniors have looked forward to. It’s a great time for the kids to really reflect on the end of their high school football career. It’s an emotional thing most of the time. The more invested the kid is in the program, the more emotional this last 40 is for them. How we do it: during the last week of the regular season, on Wednesday of game week, we run 40 yard dashes for conditioning. We run 40s every Wednesday for conditioning. We don’t condition on Thursdays. So, we have the seniors run their “last 40” which means that their conditioning for football is done. (I don’t do conditioning during the playoffs because I’m a strong believer we should be where we need to be by then, and I like to do a bulk of conditioning by playing game speed during practice.) This last 40 represents all of their hard work in the weight room and on the field running all of those springs, doing all of those drills to get ready for football, etc. coming to an end. We make a tunnel with all of our underclassmen, coaches, and any parents that come out to celebrate this milestone. We have the kids run from the goal line to the 40 yard line. We line up the underclassmen, coaches, and fans every few yards on two sides to create the tunnel. Then myself and usually the coordinators are at the 50 yard line to give the kids a big hug. We let the kids do whatever they want for this 40. Some kids walk it, some kids skip, some kids do a few cartwheels, but I would guess about 75% of them do the hardest sprint they can! We like to give them that freedom to show their personality. A lot of the linemen like to walk it, or sprint 20 and then jog. That’s always kind of funny. Sometimes the kids that know they are a little clumsy will trip on purpose, stuff like that. It’s a great tradition! 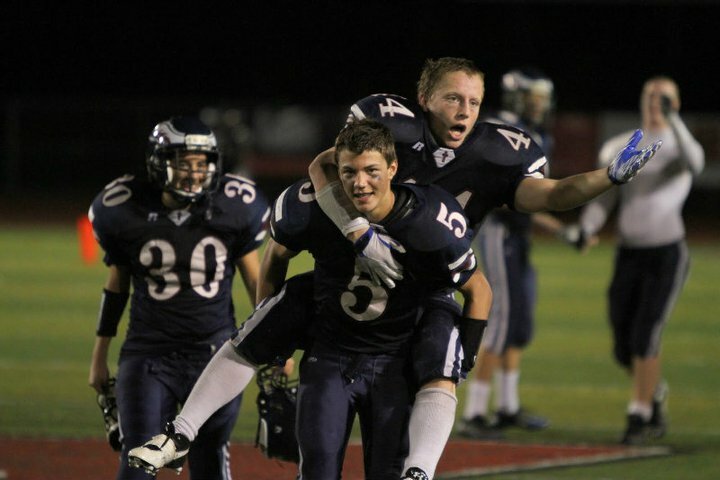 Senior Phil Wilhelm being carried off the field by froshie Sam Sukut, November 2010. This is another tradition from Fallbrook High. I don’t know how or why it started, but I like it. At Fallbrook, our stadium was about 400 yards from the locker room, a long walk. During the entire last week of the regular season, the underclassmen would have to carry off the seniors, all the way to the locker room. 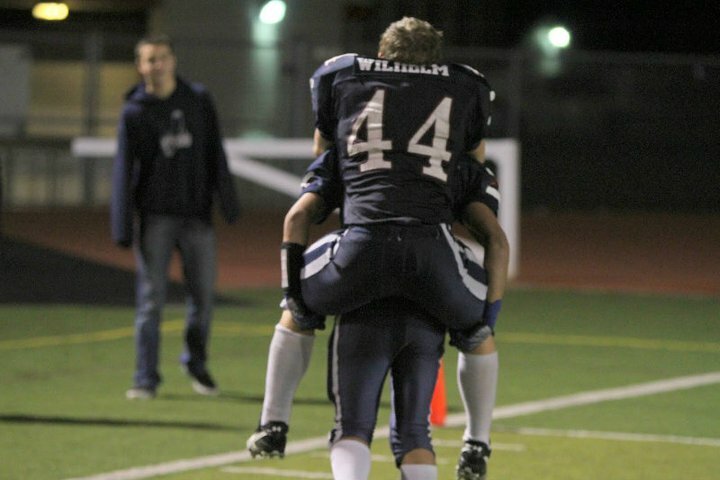 Usually, two underclassmen would partner up to carry a senior. Some seniors would make you carry them the whole way, and some just wanted you to carry them to their car, or just off the field to the track. We had one kid, Bill Hernandez, who was 6’8″ 375! Big dude! It took three other linemen to carry him off. Again, this is a tradition I’ve used every year as a head coach. Luckily for my players, we were never too far from the locker room. Less then 100 yards in both schools I’ve been at as a head coach. So, I always liked to have our huddle at the end of practice on the far end of the field! 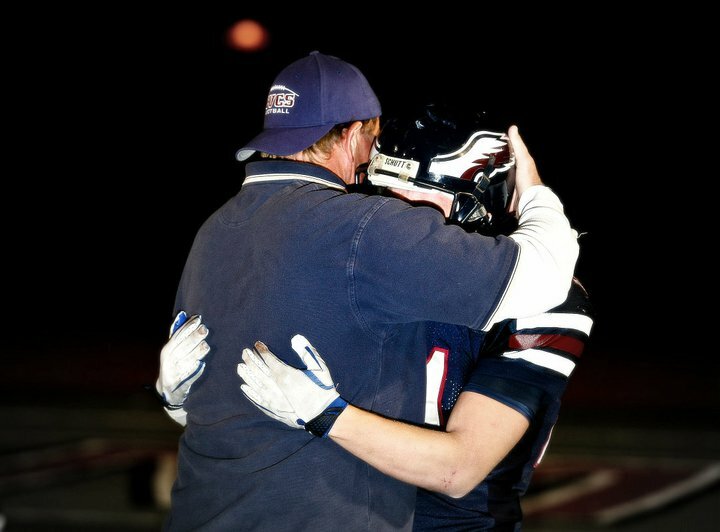 Defensive Line Coach Matt Cobb saying goodbye to a senior in 2010 at Capistrano Valley Christian. After the last game, whenever that is, all of the underclassmen and coaching staff says good bye to the seniors one on one. I can’t remember when I started this tradition, but it’s probably my favorite of these three. It’s the most emotional time of the year for the kids, because unfortunately I’ve never been on a team that won the Section Championship, so it either comes after the last regular season game if you know you aren’t going to the playoffs, or after your playoff loss. Either way, it’s the end for the seniors. No more football ever for most of them. 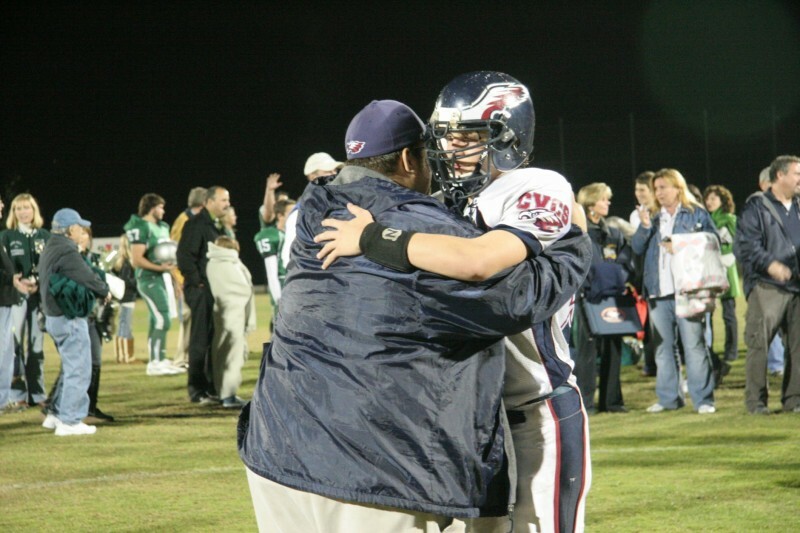 Saying thank you and goodbye to my center Shane Melzer at Capo Valley Christian, 2007. We all gather in the end zone after the game for a short talk about the game. Then, I have all of the seniors line up in their spots. The way I line them up is four seniors on every 5 yard line. So, on the goal line, there are four seniors – two on the numbers and two on the hashes. Then on the 5 yard line, there are four seniors, two on the hashes, and two on the numbers. You should be able to picture this. We do as deep as we need to. I then make a line of the underclassmen and coaching staff. They start with one of the seniors on the numbers and then move across to the other three, and then move to the next line. So, what you get is a snake of the underclassmen and staff working their way through all of the seniors one on one. The underclassmen and coaches say thank you or whatever they want. They speak first to the seniors, and then the senior can say something. It’s private and personal. Everyone usually hugs. Josh Hector says goodbye to senior Reid Nelson. Josh is now at University of Oregon and Reid at Arizona. For me personally, as the head coach, I’m always in tears. You’ve usually spent four years with these kids and this is good bye to them as a player. It’s an emotional time for everyone. I encourage you to build tradition in your program. Little things like these three ideas go a long way to build tradition, pride and a heritage the kids and community love.